This week just keeps getting better! 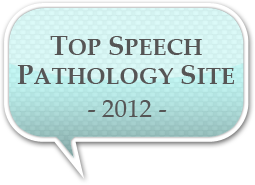 Not only was my first guest post published (with another one on the way tomorrow) but I just had the pleasure of being informed about LTSL's inclusion onto the list of the Best 100 Sites for Speech Pathologists being published at OnlineSpeechPathologyPrograms.net . Aside from this being great news, this list is also meant to be a resource for those interested in the profession. Their collection of websites and blogs about speech therapy, speech pathology, and general linguistics are a useful resource for anyone looking for information about the subject, or even considering a career in speech-language pathology. I encourage you all to visit! Congrats on everything! Thanks for letting me know about your blog. I added it to my blog list to read. Laura and Rachel, thank you for adding me to your blog list, I have added you as well!